We may be feeling a little beat down these days, but it’s hard to complain. The farmers market has been crowded, our CSA is completely full, and we’re taking on more restaurant accounts this year. Busy is good, overwhelmed is not. So we’re trying to walk that delicate line as carefully as possible. Still, with the craziness of farm chores the kitchen remains one of the few areas in my life where I feel competent. I’m certainly no chef, but I am a curious cook. My favorite thing to do is see what our neighbors and fellow farmers market vendors have available and pair that with something growing at the farm. This salad is a perfect example of what happens when you stare in the fridge and let your mind wonder a bit. 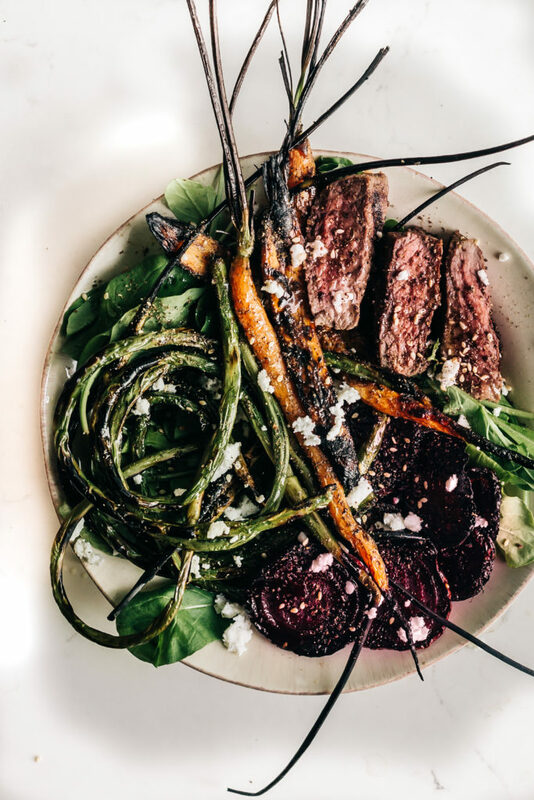 This meal was inspired by a few leftover beets and carrots from the farmers market this past weekend and a lovely top-sirloin steak that we bartered for from our favorite rancher. The garlic scapes (which are treated as a delicacy around here) were a highlight. And the feta cheese that was gifted to us from some CSA members from their favorite Portland creamery was a great addition. Everything on our dinner plate was traceable to its grower and as Taylor and I sat down to dinner it felt as though all of our friends and farmers were sitting at the table with us. I didn’t grow up eating seasonally (or locally for that matter) but somewhere on my journey as a farmer over the past 10 years, I’ve learned that food grown by us or raised by people we know, simply tastes better. I hope this salad inspires you cruise a local farmers market or co-op, call over the neighbors, and indulge in the simple flavors of the season. Heat an outdoor grill to medium-high heat. Drizzle the vegetables and steak with olive oil and plenty of salt and pepper. Place the veggies directly on the grill grates, being careful not to let them slip between the grates. And cook for about 4 minutes per side. The garlic scapes may char a bit faster so keep a close eye on them. Once the veggies are charred and crisp tender, remove them from the gill. Place the steaks on the grill and cook for about 4 minutes per side for medium-rare. Place the arugula in a large bowl. When cool enough to handle slice the steak into bite size pieces. Toss the arugula with the veggies and steak and sprinkle with feta. Whisk together all the ingredients for the dressing. Drizzle the dressing over the salad and enjoy. Andrea, I’m amazed that you have time to publish anything during growing season. I am impressed by your creativity and commitment. Every recipe is interesting and creative. Hope you have a prosperous season and that another cookbook will be coming in the next year or two.